So, here’s a brief look at Daredevil: End of Days #3 so I can get it out there before the next issue in the series comes out next week! 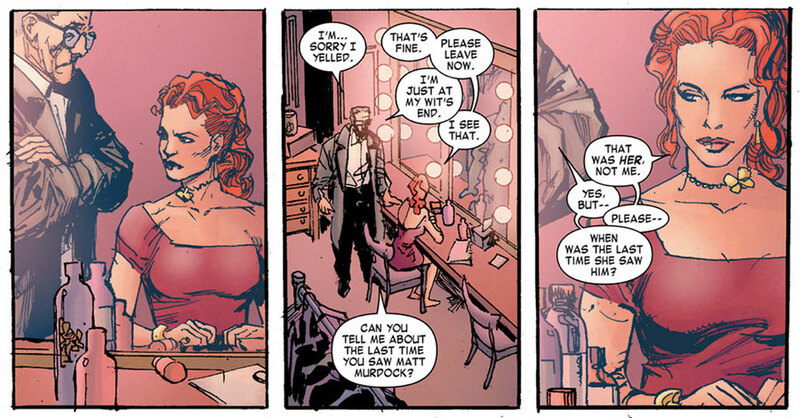 As I mentioned in my Daredevil #21 review, I’ve been very pressed for time lately. However, I’m going to have to level with you: That’s probably not the only reason this particular post hasn’t seen the light of day until now. Believe it or not, but reviews are actually the hardest type of post for me to write, and they’re especially tricky when I find myself conflicted about the issue in question. My reviews of the main Daredevil series come pretty close to writing themselves because I enjoy each and every issue so much, but so far, I’m just not really “feeling” End of Days. Daredevil: End of Days is an amazing-looking book – drawing on the respective strengths of no fewer than three artists – and, depending on how things finally play out in the end (this is only the third of eight issues), these first individual chapters may end up paying off in big ways. The way Brian Bendis, here with co-writer David Mack, wrote the main Daredevil title years ago benefited greatly from being collected in a longer format and I suspect this might be the case here too. This means that we haven’t actually covered all that much ground yet. While the final scene opens up a mystery that is sure to change the direction of this series in upcoming issues, End of Days #3 mostly continues the reunion tour that Ben Urich set out on last issue. This is interesting in itself, but offers little in terms of plot progression. As someone who loves low-key character moments more than big fight scenes, I shouldn’t complain too much about this. 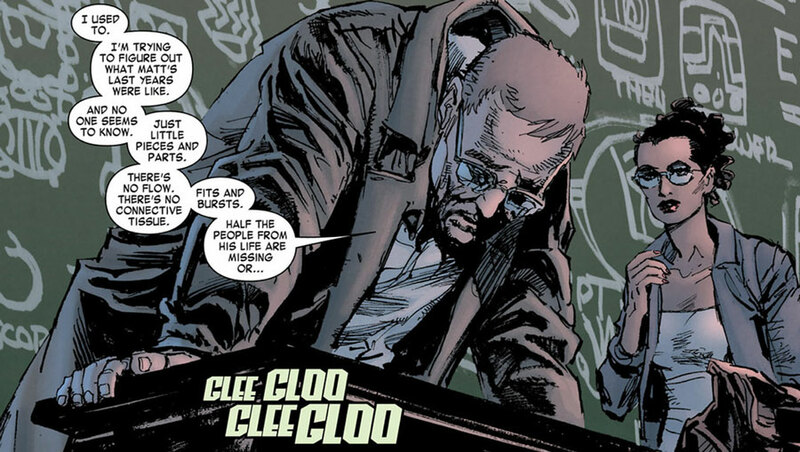 However, it seems to me that having Ben Urich check in on all of Matt’s past acquaintances the way he does relies a little too much on the readers’ ability to bring the necessary feelings of nostalgia to the experience. One of the people Ben checks in with this time around is the now permanently reformed “Typhoid” Mary (seen above) who has once again found work as an actress. She is also the mother of twin boys who bear a striking resemblance to Milla’s and Elektra’s respective sons, and to Matthew Murdock. Time will tell whether we’re dealing with some kind of The Boys from Brazil scenario or whether this is meant as an in-joke aimed at Matt’s libido. I’m hoping it’s the latter; the former sounds complicated. As I mentioned, the artwork in End of Days is stunning. While I’m not in love with Klaus Janson’s too maniacal take on Elektra (or his continuing the tradition of artists constantly forgetting to have characters actually face Maya when they speak), he does a fantastic job of creating a suitably gritty world for Ben to move around in. And, Matt Hollingsworth’s slightly desaturated colors help create the right kind of mood. 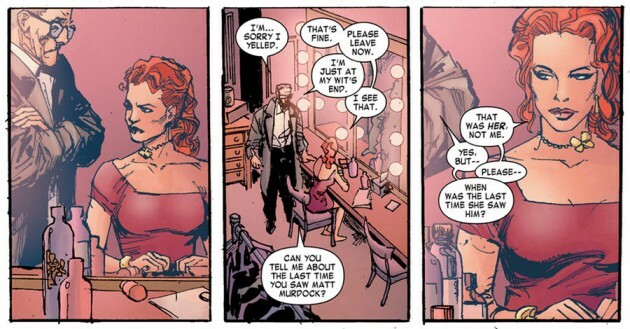 The painted art by Bill Sienkiewicz and David Mack is used to create a very different kind of mood for the flashback scenes, such as the one below in which Maya “Echo” Lopez remembers her last encounter with Daredevil. I think this page is gorgeous and would happily put it on my wall. To sum things up, End of Days continues to be beautiful and continues to hold the promise of greatness. But, it’s much too early to tell whether the finished story will be mind-blowing or just the world’s best Daredevil coffee table book. Without any real sense of whether investing in these characters will be time well spent, I find myself just noting the events and characters as they appear and postponing my emotional involvement until the story itself starts begging me to care. I like the nostalgia, and am mildly intrigued by some of the mystery, but so far it’s not enough to really make me sit up and take notice. Christine, I don’t think this all that negative of a review. I’ve seen in the past that creators often follow your blog, which would make me very self-conscious. You’re always thoughtful with your reviews and I respect that/I’m sure they to too. I’m not sure yet, but I would be surprised if all of these children were not Matts’. (I had to follow your Boys from Brazil link; I’ve never seen that movie). It does look like what we’re dealing with and it would explain Matt’s extreme reaction when Kingpin returned to the country. I have been curious from issue to issue. Well, the review probably isn’t all that negative because I don’t in any way dislike End of Days. It’s entertaining enough and there is much to like. I also think it does hold some promise for a big reward later on. I’m just not passionate about it, not counting down the days to the next issue like I do with the main book. But I see other reviewers out there who seem to think this is a masterpiece and I just can’t get behind that level of praise at this point. Cool. I’ll check it out. That said I’m looking forward to issue #4 when it comes out today – this has been in the works for such a long time and I’m such a huge fan of the Bendis run I’m expecting a brilliant conclusion. In my opinion, this series isn t astonishing, but the plot is getting better with each issue. It has kept me interested. I dont think that this issue will be on a par with what Bendis did on DD years ago. On the bright side I prefer any Bendis decent story, than Waid s DD.